A basic understanding of Angular 5 and Node.js is needed to follow this tutorial. The demand for realtime functionality in applications these days has grown tremendously. People want to see how users interact with their applications in realtime. Here comes Pusher, allowing you to add realtime functionality to your application by using concepts such as events and channels. In this article, we are going to look at how to add realtime functionality to your Angular 5 application. We are going to make an application that gives realtime feedback when a picture is liked. In other words, you get to see in realtime when users like a picture - interesting, right? To do this, we will be using Angular 5 and Pusher API. If you get version numbers as results then you have them installed. Node 6+ and NPM 4+ should be your target. Now we are not going to dwell too much on the intricacies of building an Angular application, rather, we will be more concerned about adding realtime functionality to the application itself. For more information about Angular basics, head here. After running this, we get a basic Angular starter project which we are going to build upon. We can see from the above that the buttonClick event has been tied to a function called liked() which we will take a look at now. Now we can see when we examine the component that we specify the title and the number of likes for starters. NB: In a real world application, you will want to make a request to your backend server to get the actual number of likes instead of using static data. We can also see that we plan on injecting a pusherService in the constructor of our app component. We are going to explain more about this in the next section. At this point, we have our application that allows us to like pictures, but other users don’t get realtime feedback as to the number of likes the picture actually has. In comes Pusher to save the day. 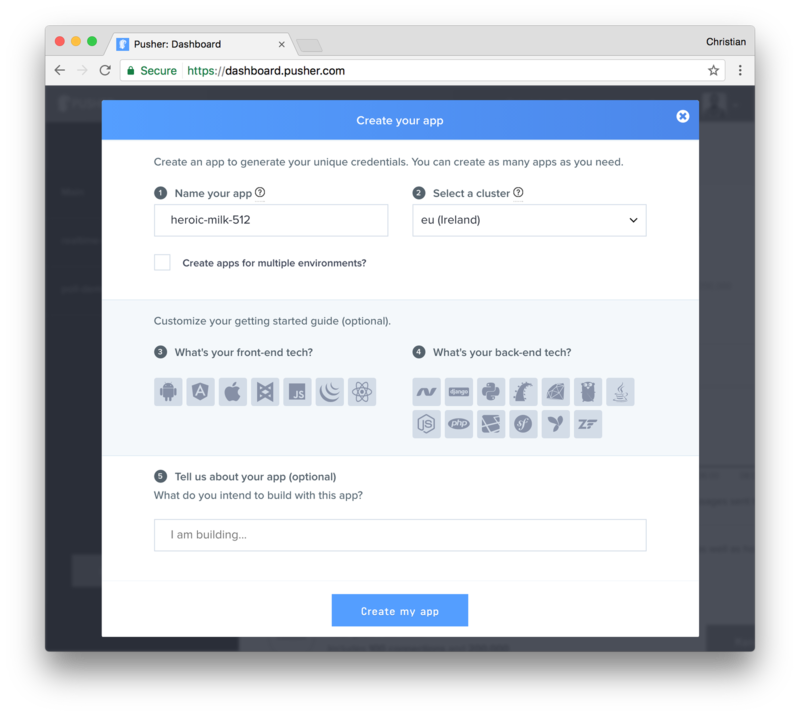 Pusher allows you to add realtime functionality to your application without you having to stress so much about the logic of making this work. All you need to do is to subscribe to a channel and then listen for events - in simpler terms it’s like turning on a TV to a football match (channel ) and then waiting for a team to score a goal ( event ). Now that we have successfully installed the library, the next thing we need to do is to add it as one of the third party scripts that will be loaded by Angular when our page is being loaded. Now lets get to using the pusher client. Earlier on, we spoke about the PusherService and now we are going to see how it works. In angular, there is a concept called services - which, as the name suggests, helps you to do one thing really well. If you used older versions of Angular, the new HttpClient may seem strange to you because it was just introduced with this new version to make life easier for Angular developers. With this new HttpClient, responses are defaulted to JSON and interceptors are now being used for easier error handling. You can read more about it here. These details can be obtained from your Pusher app dashboard. Click “Create New App” from the left sidebar. In the constructor for the PusherService , we included the HttpClient and then subscribed to the events-channel . We also have another function that makes a POST request to our backend server with the number of likes as part of the body of the request when the like button is clicked. In the above, we import the pusherService and then add it to our constructor. 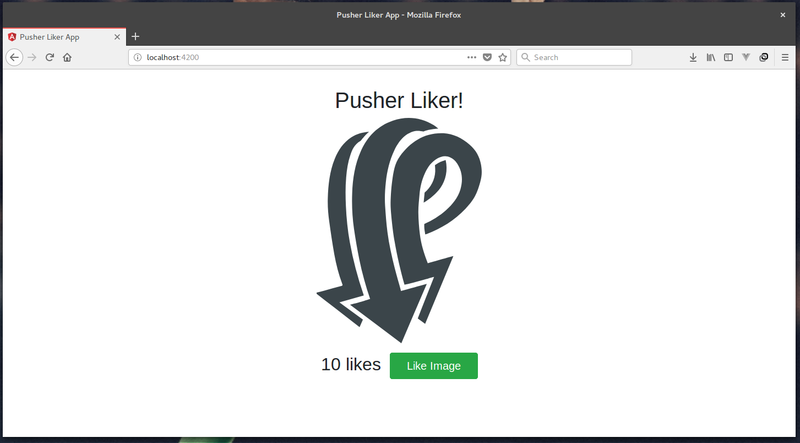 Now, when the component is created, we then bind the pusherService to the new-like event and we update the number of likes with the new number of likes that we get. As we can see in the liked() function above, the pusherService.like() is also called to help make the request to the backend server to actually trigger the like event. These details for the Pusher client can be obtained from your Pusher dashboard. This application only has one route that triggers the new-like event to the events-channel which our Angular frontend listens for and then updates accordingly. Now, the backend server will be run at localhost:3120. In this article we have seen how to add realtime functionality to an Angular 5 application. The use cases for this are endless. You can give users realtime feedback as they interact with your applications — Twitter has a feature similar to this where you can actually see the number of likes, replies and retweets in realtime. The ball is in your court now to implement that realtime feature you know your users will love to have.